As a serious home barista, you may be considering investing in an espresso machine to grace your kitchen countertop. There are several big name makers out there who have espresso machines on the market, so which do you choose? Well, because we know just how busy you are, we’ve taken time out on your behalf to research the espresso machine market for you. In this buyer’s guide, we’re looking at espresso machines made by De’Longhi. Ah, we thought you’d ask. Well, De’Longhi is an Italian company that’s been around since 1902. They make all kinds of useful home electrical appliances from deep fryers and heaters to air conditioners. And yes … espresso making machines. In the case of espresso machines, the old maxim, “you get what you pay for” is absolutely on the money, so to speak. And remember, if you “buy cheap, you’ll buy twice.” Enough already. No matter how much you have to splurge on a shiny new De’Longhi espresso machine, you should find one to fit your budget among those we’ve picked out. We’ve included a helpful overview of the good, bad, and ugly for each machine, but click on the link if you want to see the full product specs and order the De’Longhi espresso machine of your dreams. It’s worth mentioning here that all De’Longhi machines come with a long warranty of up to two years, so you’re covered in the unlikely event of a problem. Drip trays, removable water tanks, and quality (often stainless steel) materials are also common features. Here, in no particular order are our favorite De’Longhi espresso machines. 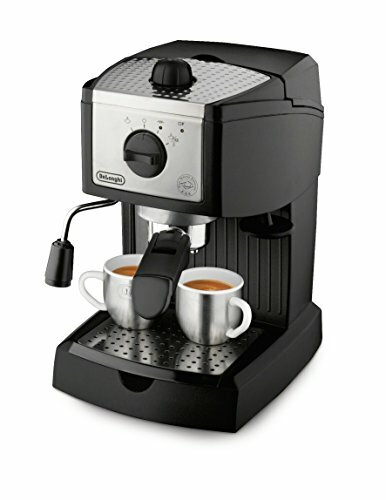 This is De’Longhi’s super-duper, top-of-the-range espresso machine; they don’t come much better than this! 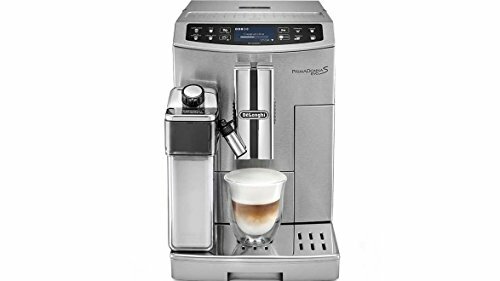 The Prima Donna is equipped with De’Longhi’s patented single-touch Lattecrema system that delivers a super-thick, rich and long-lasting cappuccino foam. And the massive 4-pint water reservoir ensures that you won’t have to take frequent brewing breaks to refill the machine. Although this is undoubtedly a major investment, if you’re serious about your home brewing, this machine does do it all. You’ll never need to buy an espresso machine ever again if you splash out on this bad boy! If all that tech is a tad frightening, don’t worry; De’Longhi has included a full DVD instruction manual. Be sure to watch the whole DVD, so you understand exactly how the machine works and take advantage of all its features. Now, if you thought that a feature-packed, top-of-the-line De’Longhi espresso machine was out of your budget, think again my friend. So, the Magnifica is basically a scaled-down version of the Prima Donna (above). The result is a much more affordable machine that retains just the features you’re most likely to need and use to create a great espresso. 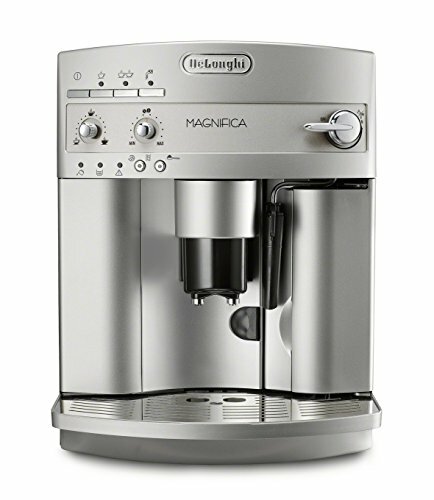 Although the Magnifica is now among of the De’Longhi’s older models, it’s still one of their best sellers and is the least returned espresso machine of any manufacturer. One minor gripe that has been reported by owners of this De’Longhi model is that the grinder is quite loud, which can be a pain if you set the machine to brew your early morning Java. Well, anyone who loves their coffee would get a whole lot from this machine. And for the price, you won’t find a comparable espresso machine of this quality under any other brand. The Magnifica is perfect for beginners because of its simplicity, and more experienced baristas will love its hassle-free reliability. And everyone will enjoy the fabulous quality coffee it makes. If you liked the Magnifica but you’re concerned that your counter space is too limited to accommodate it, the Compact version might be your solution. The main irritation factor with this machine is that the coffee beans sometimes don’t drop smoothly from the hopper into the grinder and need a little help. Also, the machine has a manual frother, but many home baristas prefer to customize their drinks anyway so this probably won’t be an issue for most. Personally, we wouldn’t let this be a deal-breaker, as everything else about this machine is great. If you want reliability against everything else, go for the older model ECAM3300. If an occasional sticking coffee bean is not a problem for you, choose the improved functionality of the upgraded ECAM22110. If you’re a beginner barista, you may not want to risk spending a fair chunk of your savings on an espresso machine at the very start of your brewing journey. So, what’s your alternative? 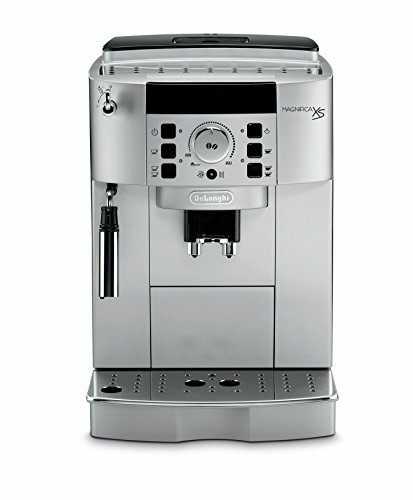 Well, our next selection, the EC155, from De’Longhi’s wide range of espresso machines has you covered. The EC155 is a single-boiler, semi-automatic espresso, and cappuccino-making machine. It doesn’t have a grinder so you’d have to buy a separate one (check out this helpful article on coffee grinders) or you could use ready-ground coffee if you prefer. Helpfully, this De’Longhi machine also takes coffee capsules (pods). As you’d expect with a “budget” coffee maker, the reservoir on this model is smaller than the others we’ve mentioned at just 35-ounces. So, although you won’t get (and shouldn’t expect) the same performance and features in this basic espresso machine as you’d see in the more expensive models we’ve looked at, you still do get plenty of bang for your buck. And the EC155 still pulls a great shot of espresso! Lastly, even though this machine is seriously compact, it still has enough balance and weight to sit securely on the countertop when you’re twisting in the portafilter. As you’d expect with a cheaper machine, this one does have a few downsides. The EC155 can be very noisy and tends to vibrate a lot too. Also, your demitasse clearance is pretty low at just 2.5-inches, so pulling a lungo could be tricky. So who exactly needs this machine? This machine is ideal if you’re still not sure whether a homebrew espresso machine is for you. 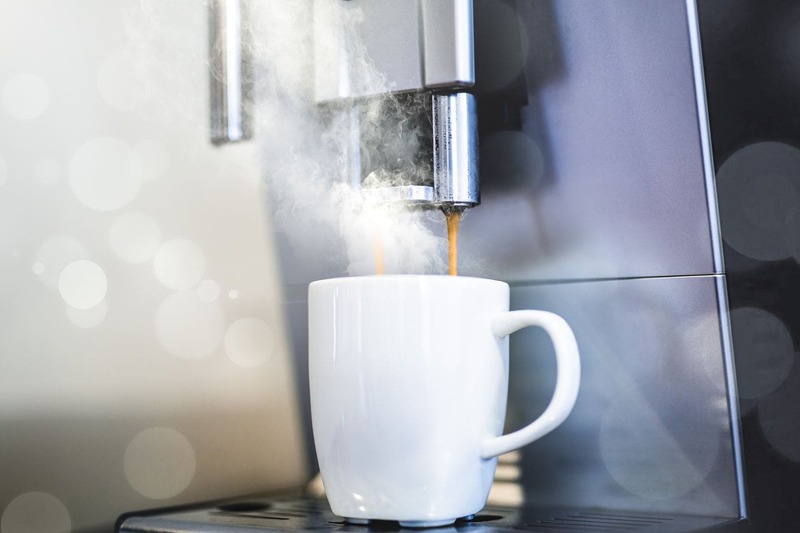 Beginners can enjoy a decent, homemade espresso-based coffee drink, and the money you spend on this machine will more than be recouped in what you would have spent on coffee shop brews over a year. Bottom line: although it’s basic and bargain-basement, the EC155 does deliver a great shot, which is why it’s one of De’Longhi’s best-sellers. For some coffee lovers, a capsule-only machine is an absolute no-no. 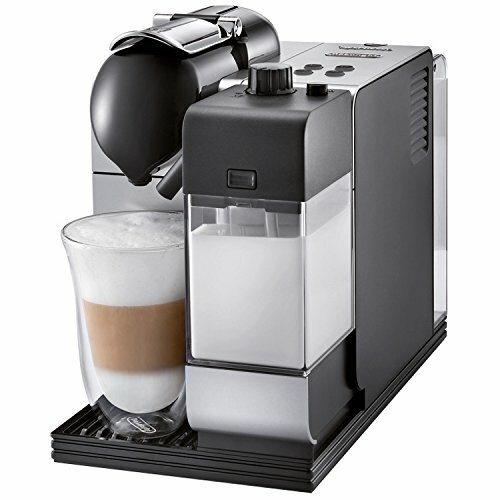 However, cut us some slack here; you may be surprised by De’Longhi’s offering. This machine will deliver a quick, convenient, delicious espresso drink with no hassles or time-consuming preparation required from you. When compared with other Nespresso machines, De’Longhi’s Lattissima is about the best you can get. The Lattissima Plus is one of De’Longhi’s OriginalLine series of coffee making machines, which is the predecessor to VertuoLine by Nespresso. One massive plus in the Lattissima’s favor is that the machine will take cheaper, non-Nespresso pods, unlike the VertuoLine machines that only accept Nespresso’s own-brand pods, effectively reducing the price of your brews. If you’re looking for the convenience of a machine that will make you a great-tasting brew of consistent quality, time after time, look no further. Many committed home baristas also have a capsule machine in their arsenal for times when they need a quick brew without the hassle of having to make one from scratch. Really, it’s nothing to be ashamed of. Okay, so now you know which De’Longhi espresso machines we recommend, let’s look at some important considerations you need to make when choosing one. What coffee-based beverages to you want to make? If you only drink espresso, don’t waste money on a machine with a frothing wand. For dairy fiends choose a machine with a good milk frother and don’t be too concerned if the espresso shot is not 5-star quality. The milk or cream you put into the espresso will dilute the flavor anyway. If you enjoy drinking a straight espresso and you also like to make other espresso-based drinks, the machine you choose should be able to pull consistently great espresso, and it should also have a good frother. Based on this, you can now rule out any machines that don’t meet your needs. That’s a no-brainer. Whatever your budget is will limit you to what machine you can have. It makes sense to buy the best espresso machine you can afford, but don’t waste dollars on one that does more than you need it to (see our previous point). How serious are you about brewing your coffee? If you’re a dedicated and avid coffee fan, you will want a really good-quality espresso on which to base all your drinks. In this case, a top-of-the-range machine with lots of bells and whistles will be the best choice for you. However, coffee drinkers who enjoy great coffee but don’t want to expend time and effort making their own custom brews will be more than happy with a semi-automatic or automatic espresso machine. Complete beginners may be happy with a capsule machine or a smaller, lower budget semi-auto espresso maker. Some at-home baristas also prefer higher-end semi-auto machines because they tend to give users more control over the brew. No-one (normal) likes to spend hours cleaning up their kitchen. So, consider this: once you’ve pulled your perfect espresso shot and frothed some barista-quality foam, how long do you want to spend cleaning up? Generally, the more complex the machine, the more cleanup will be required. Capsule espresso machines tend to be the least labor intensive when it comes to post-brew cleaning up. If you have a tiny countertop, don’t buy a huge espresso machine! Trust us on this one, too many fancy gadgets end up at the back of kitchen cupboards after one or two uses, never to see the light of day again. Choose a machine that fits the space you have available. The answer to this question will be somewhat influenced by your budget. Spending $100 on a De’Longhi espresso machine is a huge investment for some coffee lovers, but loose change to others. Now, De’Longhi machines are reliable and built to last, but things can sometimes go awry, potentially leaving you with a repair bill. Check what warranty you will get with the machine you’ve chosen, and always look at reviews on the net that have been left by other purchasers. And finally, if you’re still not sure which model to go for, shoot us a question here at Roasty. We’re here for you, coffee fan!